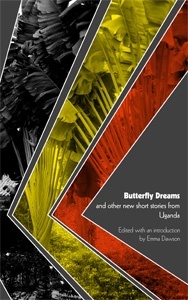 Butterfly Dreams is a spiritual and physical journey of a young girl from Alokolum, Gulu, who is captured, tormented and devastated by the war in Northern Uganda. Everyday, her family listen to MegaFM Radio for news of her return, but the strength in their hope fizzles away the darkness. When the protagonist returns from the place of war, traumatized by unimaginable fear, her family hardly know how to react to the change in her, and daily they will try to adjust to this new person. This story, written by Beatrice Lamwaka – who also comes from Alokolum – was short-listed for the 2011 Caine Prize for African writing, a prize that many writers on the continent aspire to win. Labalpiny read out your name on Mega FM. This was an answer to our daily prayer. This year’s winner, NoViolet Bulawayo, whose name is recorded in Africa’s literary herstory, is a genius of words herself and also a friend to Beatrice. The shortlist, Beatrice says, has strengthened the belief in herself as a writer. However, when she writes, she says it is important she does it without the conscious nagging of being a short-listed winner of this prestigious prize. Beatrice hopes to be published one day, and we are all certain that she will be. And what’s more; her book will make us proud. Startjournal.org: This nomination, which has put you on the map of African writing, has made many Ugandans proud. What do you feel yourself about this accomplishment? Beatrice Lamwaka: It has given me confidence as a writer. Now I know that if I put all my energy into the writing, lots of good compositions will come out of my pen. All the long nights of writing will one day pay off. This has really made me appreciate the overwhelming support I got from Ugandans all over the world. At one point, I thought the shortlist was my pride alone, but then I realized that I was carrying the national flag. I had people supporting me all the way. And that felt really good. It is nice that people recognize me from my writing. Start: Do you know anything about the writing journey of the winner, Noviolet Bulawayo? BL: NoViolet and I were among other people short-listed for the PEN/Studszinski literary award in 2009. Our short stories are published in New Writing from Africa 2009, and that is when I first “met” her. I am sure that we shall meet again in the literary arena. She is a brilliant writer and I am confident that lots of excellent writing will come from her. Start: Have any publishing houses approached you since the ? BL: No, unfortunately not, but I cross my fingers that one publisher will approach me because of the shortlist. Start: What is your personal take on literary prizes? BL: Literary prizes are important because they bring the world’s attention to the winning writers, otherwise the writer would have remained unknown to many readers. The awards also make the media focus on writers, and of course the writers need this kind of attention. And finally, the money is good for writers who hardly get much from their works. Start: Has there been increased pressure on you now, being a short-listed writer for this prestigious prize? And how has that affected your writing? BL: Yes, I believe there has. Now I feel that I must write something worth noting, because getting only the shortlist shows that I am still on a journey to mastering the art of writing. But I have realized that each story has its own energy, its own life. So I need to write the stories as they come, and while writing I can not allow myself to constantly think about former achievements. Start: How do you think this nomination will change the perception of Ugandan literature? BL: I hope the public will begin to take notes that there are Ugandans getting recognition for their writing and that there is plenty of written stories by Ugandans. I dream of a time when Ugandan writers will become household names and people will sit down to discuss these excellent writings. Through my column in The Saturday Monitor, I always ask Ugandans whether they have read anything by any Ugandan writer, and most of them have not. This is quite sad, but I really hope that more Ugandans will begin to read Ugandan literature. Ugandans should know that there are many Ugandan writers out there who are working hard to create beautiful stories. Start: In your opinion, is there a definition of a Ugandan or African writer? BL: I don’t think writers should be labeled as Ugandan or African. Putting a writer in a box clips their wings, and writers should be set free to fly as far as they can go. Everyone relates with each writer’s story differently, but whatever we are dealing with is universal. Love, for instance, is a universal subject, it is not a Ugandan story or an African story. 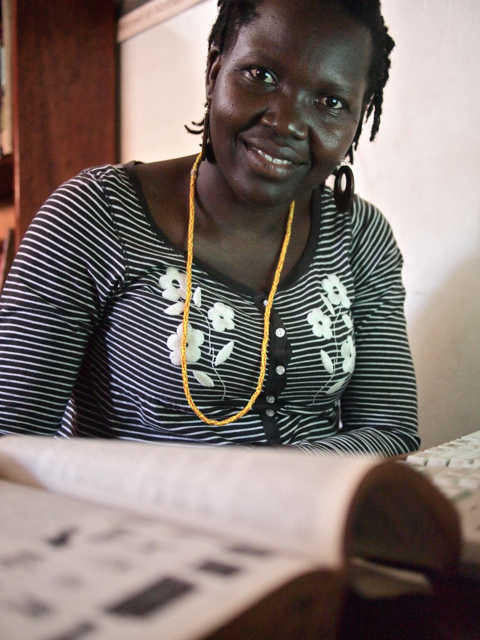 Start: What do you think of writing Ugandans writing in one of the local languages? BL: I would have liked to write in Acholi, but I know that it would be a disadvantage to me. The Acholi I speak now is diluted and I want my stories to be authentic. But then again, one may say the same about my English. I normally think and feel in Acholi, and I would like to describe those beautiful feelings without translating them. Start: Where do you want your writing to be in ten years? BL: I want my novels to be in bookstores worldwide. I can’t wait to see that happen. Start: At what time do you prefer to do creative writing? BL: I love to write at night, actually, when the world is sleeping and everything is quiet. During the night my characters will come alive and I can birth them on paper. Start: What type of books do you read? BL: For now, I am interested in contemporary African writers. I have met some of the writers and I know they are doing well, so I want to read their work. As a writer I can easily relate with their writing. And of course, my book club reads contemporary African writers. Start: What activities inspire you? BL: Life in itself is an important inspiration, because I find life being quite complicated. There are different currents flowing and each day brings in different things. And reading inspires me, because then I realize that I can put my stories into writing. Start: What is that story that you just can’t wait to write? BL: I have this idea about a female protagonist called Nakato, who is bullied about her HIV status. But she also knows that if she keeps a positive attitude, she will live another day. A character like Nakato is appealing to me just because she is so interesting, I just can’t stop thinking about her. I imagine her being a strong-willed person who enjoys everything she does amidst many challenges. BL: Writing is the best thing that I have ever done for myself. It is not easy, but I am glad that I am doing it. And there are no regrets. I am content with the stories that I am doing, and I am sure that there will be more works coming from me in the future. Beatrice Lamwaka was born in Gulu in Northern Uganda, and now lives in Kampala, Uganda. She was short-listed for the Caine Prize in African writing in 2011. 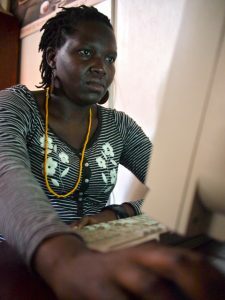 She is the treasurer of Uganda Women’s Writers Association (FEMRITE), and a freelance journalist with Monitor Newspaper and Global Press Institute. She is currently studying MA in Human Rights at the Makerere University. She was a Laureate for Council for the Development of Social Science (CODESRIA) at the Democratic Governance Institute in 2010. She was a finalist for the PEN/Studzinski Literary Award 2009, and a Fellow for the Harry Frank Guggenheim Foundation/African Institute of South Africa Young Scholars program 2009. She has worked as a researcher and teacher in Uganda; and in Italy and Sudan she worked with an international humanitarian agency. She writes poetry, short stories, and is currently working on her first novel and a collection of short stories, The Garden of Mushrooms. 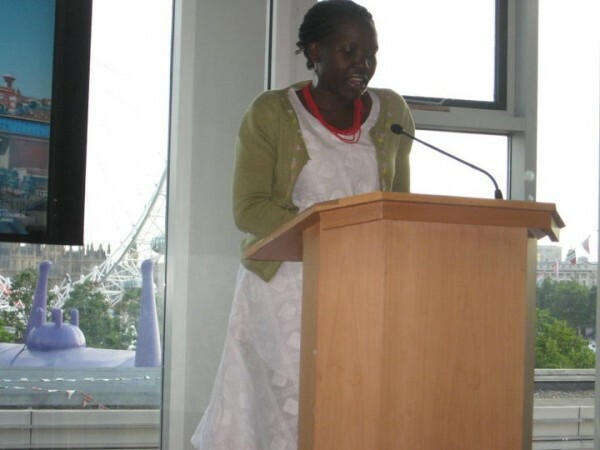 Beatrice Lamwaka reading at the Southbank Centre in the UK. Photo by Ayodele Morocco-Clarke. 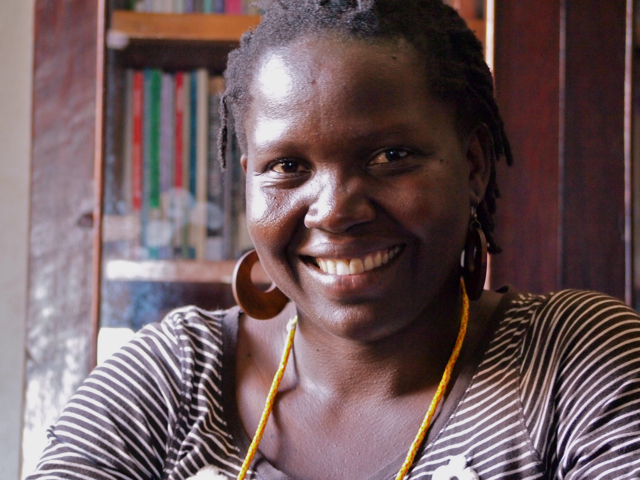 Beverley Nambozo Nsengiyunva is the founder of the annual BN poetry award for Ugandan women and published poet. All portrait photos by Thomas Bjørnskau, startjournal.org. Start would like to hear from the readers: In what way will this nominee inspire other Ugandan writers? Please join the discussion! Lamwaka means first, doesn’t it? I am not surprised at her success. Viva la continua! i write from mine and other peoples inspiration but i would like to link up with other good writers and make a ugandan writers club.